Content for mobile AR/VR apps needs to be extremely well optimized, as you all probably already know. Simplygon is a platform that lets you automatically optimize 3D content such as meshes and textures for different purposes with no or minimal manual labor. You can use Simplygon to create LOD chains, reduce draw calls, combine several high-res meshes into one cheaper mesh, optimize a scene for certain viewing angles, remove invisible geometry and so much more. Simplygon was recently released with a new free offer for personal, non-commercial and educational use. You can also contact us to get a fully featured evaluation license, to see how we can help you in your projects. Simplygon has terrible support, and has issues when trying to login to the unity plugin. Support is so unresponsive and we simply can't login. It is a nice promise but simply not functional atm. Unity Menu Window -> Simplygon > Simplygon. Q: How do I use Simplygon Grid with Unity? A: You just have to login to your Grid server instead of the cloud server. Input the IP with port included, for example 127.0.0.1:55001 and login with a valid user (default is user/user). You cannot logon to the Cloud server with a Indie licence, and so there is no account hence the "Invalid Email address/or password error"
Sorry to hear that you are experiencing issues. Here is another useful link, if you are looking for specific information: https://www.simplygon.com/knowledge-base/documentation. Wow. You literally just have to type in "user" where it requests email. And "user" where it requests password. That is insane, Sylvia. What a terrible platform. Simplygon Cloud has been discontinued.Cloud users from before November 2016 has access to email support. If you are new, request an Indie SDK key instead. There is a new YouTube video Simplygon 8 - Using Simplygon in Unity 5.4 which gives a tutorial which is relevant to Unity 5.4 F3 HoloLens Technical Preview. For those of you who want to take advantage of the new Simplygon 8 UI from the SDK. 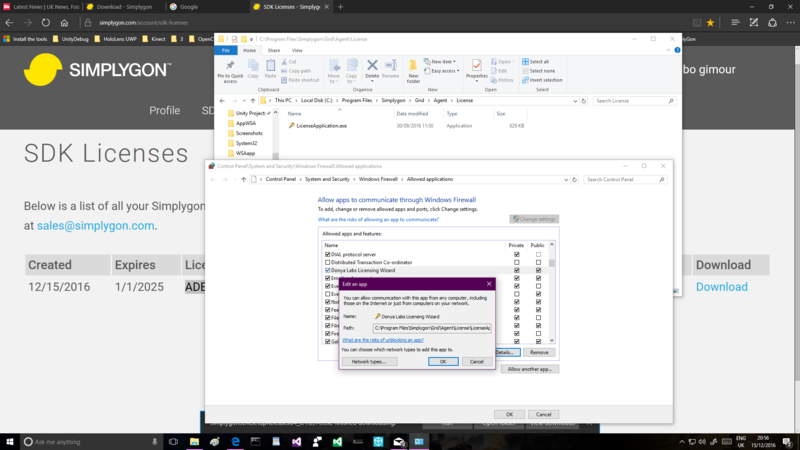 Use Windows Start Scroll down to S-> Simplygon Click on Simplygon UI. I handle the support at Simplygon and I would like to ask where you have not gotten a reply? I monitor our forums and our premium support quite diligently. When it comes to Youtube, Twitter and forums like this one it is not the normal support channel for us but I try to reply when I find an issue. As for the Unity plugin some of the design choices were based on our cloud platform which was then discontinued. In the newest version you have a button to enter the default Simplygon Grid login credentials. The user / user is just the default and can be changed in the Admin Utility - Simplygon Grid client. Through your own website support link. Still no answer, though I have figured the problem out as there was a response on this thread. Submitted several questions through your website without a response. On a positive note, once being able to finally use simplygon, it is very effective at reducing poly count. Sorry but where is our support link? Our forums and email are the 2 official support channels that we monitor. You will need to login to READ the Simplygon support forum which I find amusing, as the HoloLens forum is open to read for everyone. Is it free to use with Hololens Since MS bought this? It's free anyways. At least the Unity plugin is. I have just a very simple problem there. 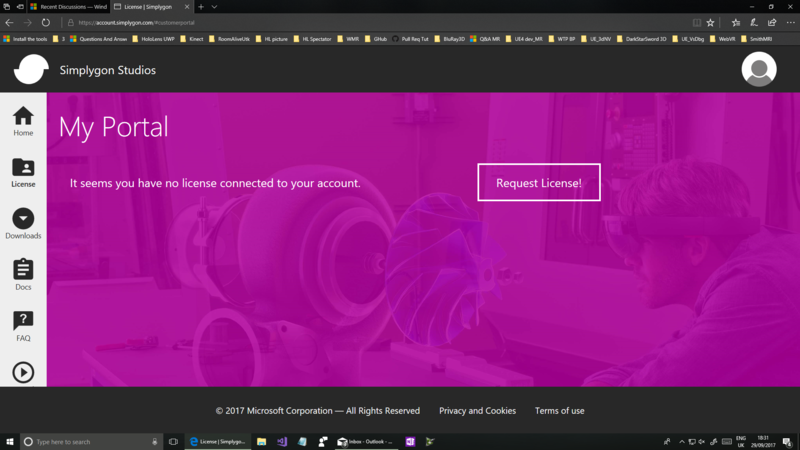 I simply cant find a registration formular for any license? I would like to evaluate it. But i cant login because i cant register. Microsoft bought simplygon so you no longer can use their stuff or even register. If you guys need to reduce polycounts without simplygon, my 3D modeling app allows you to do this directly from the hololens itself. Hey everyone - I'm having trouble getting Simplygon to work. It doesn't let me log in with the user/user login, and keeps throwing an error about no Simplygon Lib. Any ideas or help? I've attached some screenshots. and "no Simplygon Lib found"
I am having license problems using the Unity plugin. 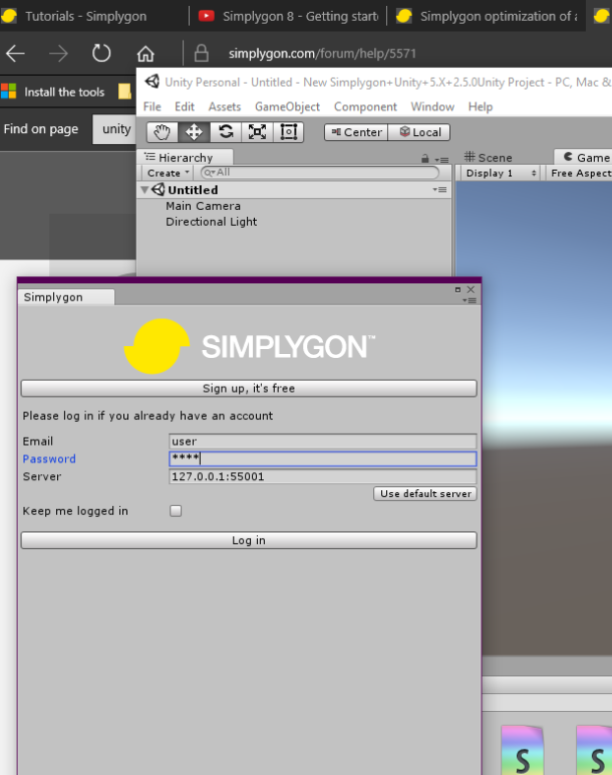 In Unity ran Simplygon and logged in as user/user. Run the [Simplygon Processing Agent - Simplygon Grid] that comes with the SDK installation. Click on the icon in the tool and go to the cog then ‘Licence’. Finally go back to Unity and under Simplygon login using Grid > user/user. I cant get any further than this. No website of Simplygon Responding or Running . Not running on Windows 10 . I don't get it--is Simplygon a standalone app only now? The Unity plugin doesn't work (username and password aren't valid anymore) and there's no download link on the Simplygon portal for the standalone app. What's the story with Simplygon? The website only shows Unity SDK's until 5.6, but nothing on the website shows any compatibility for Unity 2017, which is what I need for Mixed Reality support. Though downloading 5.6 isn't a total dealbreaker, it's obviously not an ideal solution. I also could not find any standalone Simplygon download either. If anyone figures out how to get this done please let me know.